Just How Painful is Hip Replacement Surgery? Oh? Did I Mention The Hammer? 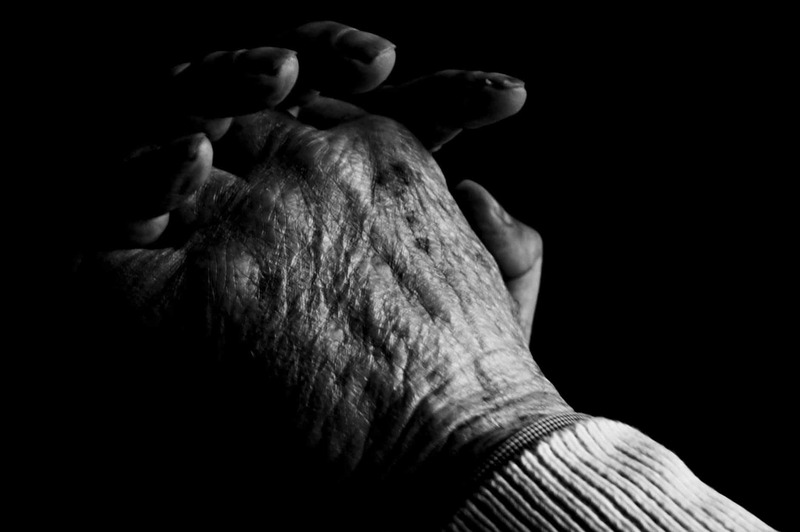 Long Time Listener, First Time Caller – Right before we left for the hospital, our neighbor stopped by and said, “I’ll pray for you.” If appropriate for you, you may consider praying before your surgery. Inherent Trust – I always tell people that this day, is the best time in the history of hip replacement surgery to have the surgery performed. Trust: it is obvious, but so critical to any medical procedure. When you start your day, trust is completely enveloping. Everywhere, every person and everything will communicate and confirm trust. Be thankful you are having surgery at a top hospital. 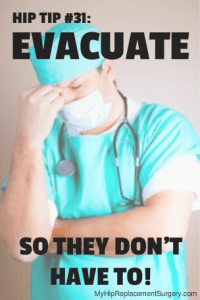 Over And Over… And Over – Your physician and the hospital staff will be very thorough the day of your surgery. By now, your wallet biopsy has been completed, so you will be asked multiple times, by every party, if you have eaten, which hip they are operating on, your name, date of birth and similar medical questions. > Got Kilt? You are not going to feel like navigating the entire length of pants after surgery, and for the first few weeks after surgery. Whether you are a man or a woman, wear shorts. If you are a man, with no shortage of self confidence, wear a kilt. > Easy On, Easy Off – Your shirts, and any other clothing should be really easy to put on and to take off. You are not going to feel like fumbling around with buttons, zippers in a weird place or any other impediment to quickly being able to dress and undress. > Walk Tropical – Wear easy to slide on and off shoes. You won’t be able to reach down to put on your shoes after surgery. Just make sure they are not unstable. > No Bling – All jewelry should be left at home. If you need to wear a wedding ring, it can be taped to your finger. > You Won’t Be Watching – Your eye contacts should be removed and glasses placed safely in a hospital holding bag. Felt Just Like A High-Class DMV Office – Most hospitals want you to arrive at least an hour before your surgery. At my hospital they gave me a queuing number and then had it posted on multiple screens in the waiting area. Just Like A Real World Facebook – The same waiting-room monitor also shows ‘status updates’ of your surgery to those waiting for you. My status updates went something like this: Joking… Nervous… Complaining… In Surgery… Success… Spacey… Complaining. Hip Tip – Confirm The ‘Bad’ Hip: I didn’t do this as it would probably annoy my very competent orthopod, but some patients have written, in permanent black Magic Marker, “Other hip,” on their good hip. 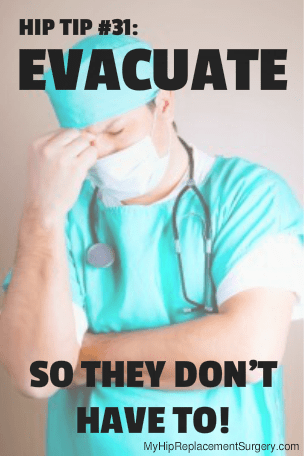 Evacuate, So They Don’t Have To – The hospital will request that you have a bowel movement the morning of your surgery. Neither they (nor you) want any room-clearing surprises on the operating table. 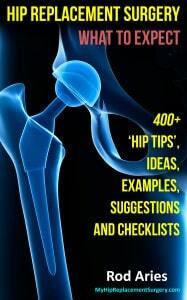 Just How Painful is Hip Replacement Surgery? Anytime a scalpel is used to cut your skin, you can imagine there will be a bit of pain. When you add a power saw that will be used to cut off the head of your femur to the equation followed by drilling a hole into the newly cut top of your femur, you wonder if it could get worse? Oh? Did I Mention The Hammer? Imagine hearing If I Had A Hammer by Peter, Paul & Mary playing in the hospital operating room as you read this. Then there is the hammer pounding of a prosthesis into the freshly drilled hole in your femur. But there is a silver lining, or two… your postoperative pain will be very manageable and you will be relieving most of your pre-surgery hip pain that has plagued you. While your experience of pain is unique to you, most patients can manage (easy for me to say) the immediate postoperative pain from hip replacement with little difficulty. The first 24-48 hours after surgery typically will be the worst period for you. In Short, An Orthopedic Jekyll and Hyde – Typically, in about 90 minutes, your orthopod will transform from Attila The Hun (where they are slicing, cutting, drilling and sewing) to Mother Theresa, (where your orthopod now carefully, competently and lovingly nurtures you back together). Having said that, it sounds worse than it really is… seriously. Celebrate The Last Day Of One Hip In Glory, One Hip In Hell – Even though this is major surgery, it will be a good day for your bad hip. Your painful hip will bother you no more (statistically speaking, of course). Alrighty… that concludes Chapter 23.